Okay, one last Thanksgiving post before the big day! I couldn’t let this year get away from me without making some stuffing (yeah, my yankee blood still calls it “stuffing” and not “dressing” like the rest of the south). One of the things that makes stuffing so delicious are the meat drippings that get soaked up into the bread. 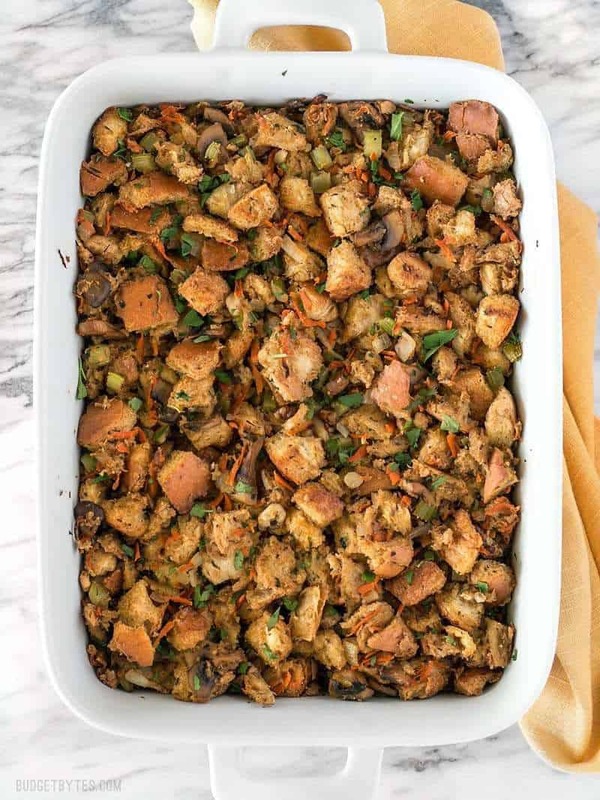 Knowing that, I decided to challenge myself and make a vegetarian stuffing that was still stuff-your-face good. Because there is always at least one vegetarian at every Thanksgiving gathering and I like to be inclusive when possible. 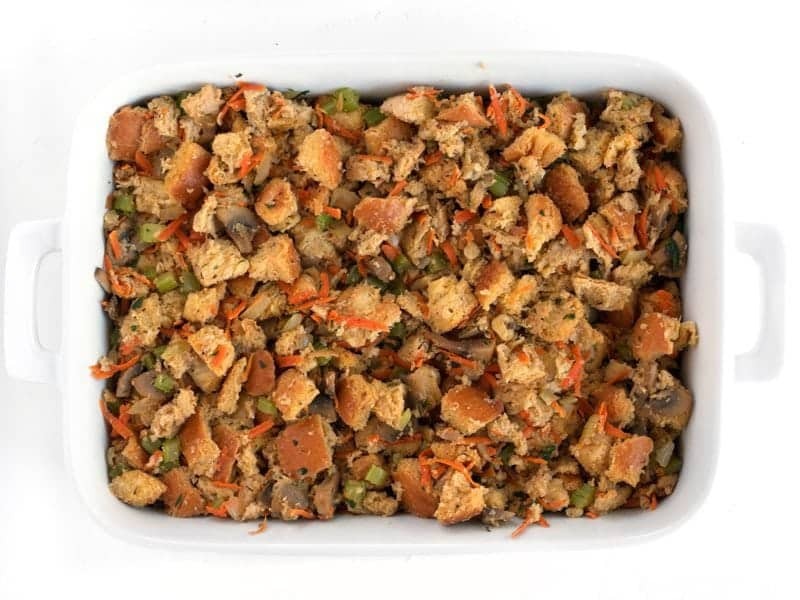 I named this one “Savory Vegetable Stuffing” because it doesn’t have any of the usual sweet notes, like apples or dried cranberries, and it’s chock-full of colorful vegetables. 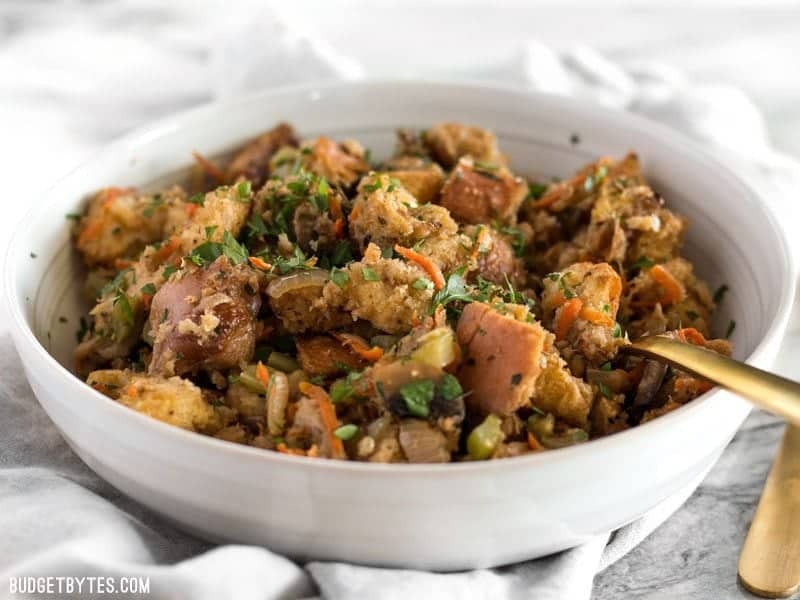 I admit this Savory Vegetable Stuffing is a little labor intensive, but it’s oh so worth the effort. If you’re making an entire Thanksgiving meal yourself, this might be too time consuming. But say you were tasked with bringing one dish this year and you have all the time in the world to put towards crafting one superb dish. This is that dish. 👌 You can even do most of the prep at home and then do the final bake once you get to your gathering (providing there is room in the oven, anyway). 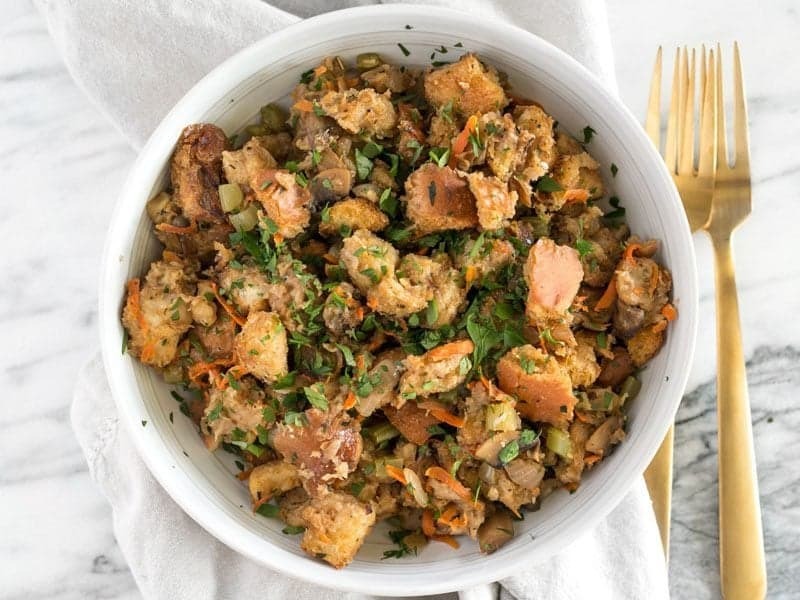 This Savory Vegetable Stuffing is full of so much color, texture, and flavor that it will be loved by meat-eaters and vegetarians alike. Begin by preparing the vegetables. Wash and slice the mushrooms, wash and dice the celery, peel and shred the carrots (use a large-holed cheese grater), dice the onion, mince the garlic, and chop the parsley. Add 3 Tbsp of the butter to a large pot along with the sliced mushrooms. Sauté the mushrooms over medium heat until they have released all of their moisture and have begun to caramelize and brown on the edges (about 5-7 minutes). Add the garlic, onion, sage, thyme, some freshly cracked pepper, and 1/4 tsp salt to the pot. Continue to sauté the onions are soft and transparent (about 3-5 minutes), add the celery and continue to sauté for a few minutes more. Finally, add the shredded carrots and continue to sauté for a couple more minutes, or just until the carrots begin to soften. 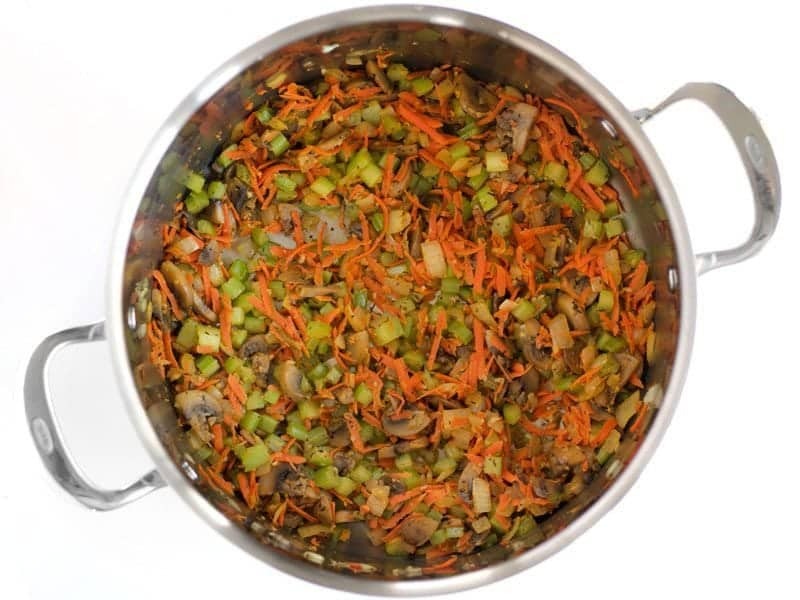 While sautéing the vegetables, add the chopped walnuts to a dry skillet. Cook and stir the walnut pieces over medium heat for 2-3 minutes, or just until they begin to give off a nutty aroma. Remove them from the heat immediately. Finally, add the toasted walnuts, the remaining 3 Tbsp butter, and a handful of fresh parsley to the pot. Stir until the butter has fully melted. 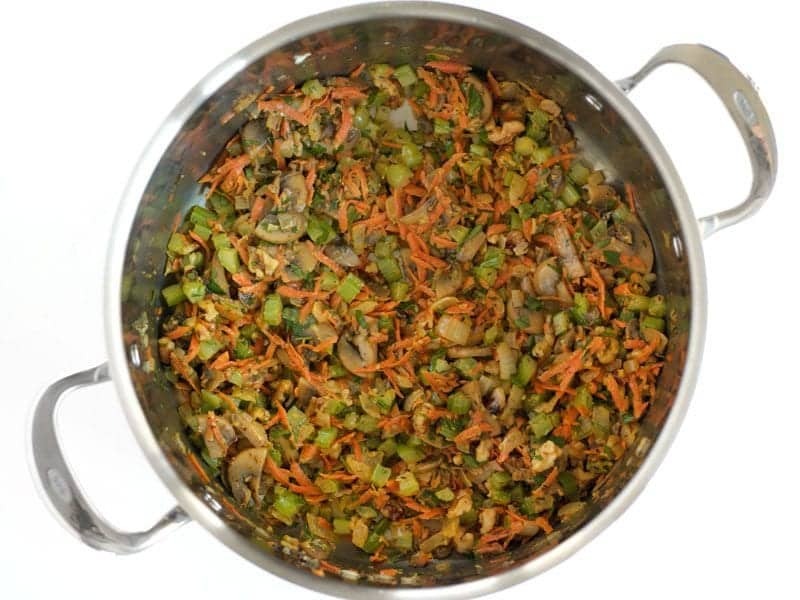 Taste the vegetable mixture and add a touch more salt if needed. It should be well seasoned. Preheat the oven to 350ºF. 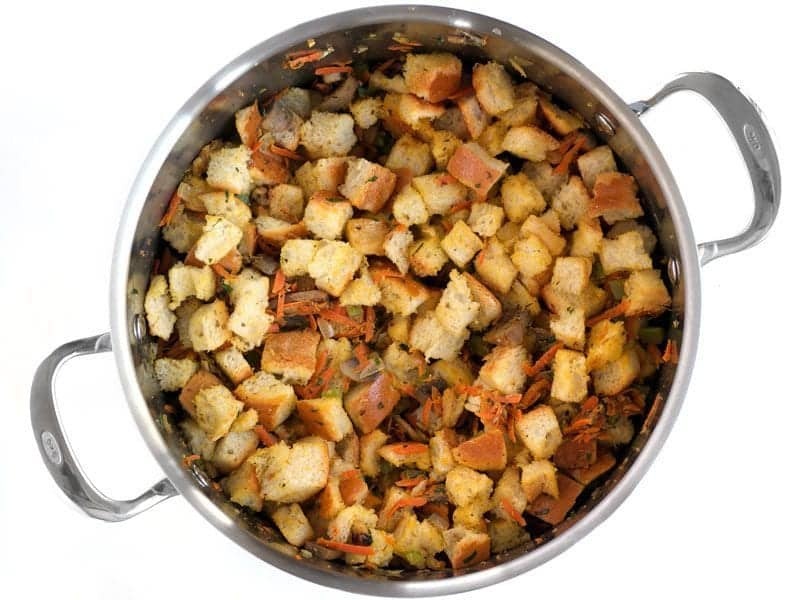 Cut the stale bread into 1/2-inch cubes. Add the cubes to the pot with the sautéed vegetables and herbs. Stir well to coat the bread in the butter. Finally, pour in the vegetable broth, 1/2 cup at a time, stirring well each time before adding more. The bread will not be completely saturated, but will absorb more moisture as the stuffing bakes. Coat the inside of a 3-quart casserole dish with non-stick spray. 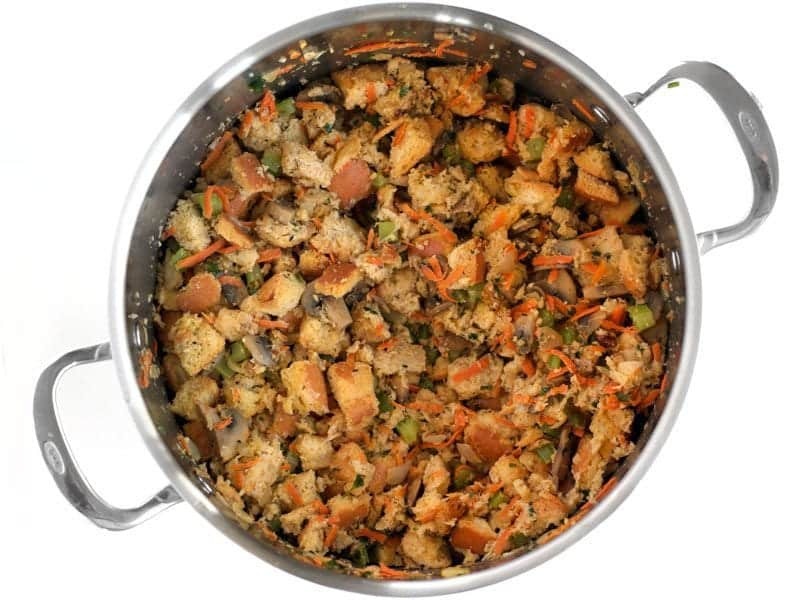 Add the stuffing mixture to the casserole dish, spread it out evenly, and compress it down slightly. Cover the dish with foil. Bake the stuffing in the preheated oven for 30 minutes, then remove the foil and bake for an additional 15 minutes, or until the top is golden brown and crispy. Garnish with any remaining chopped parsley just before serving. *I suggest buying the loaf of French bread 1-2 days prior to making this recipe so that it can become fully stale. 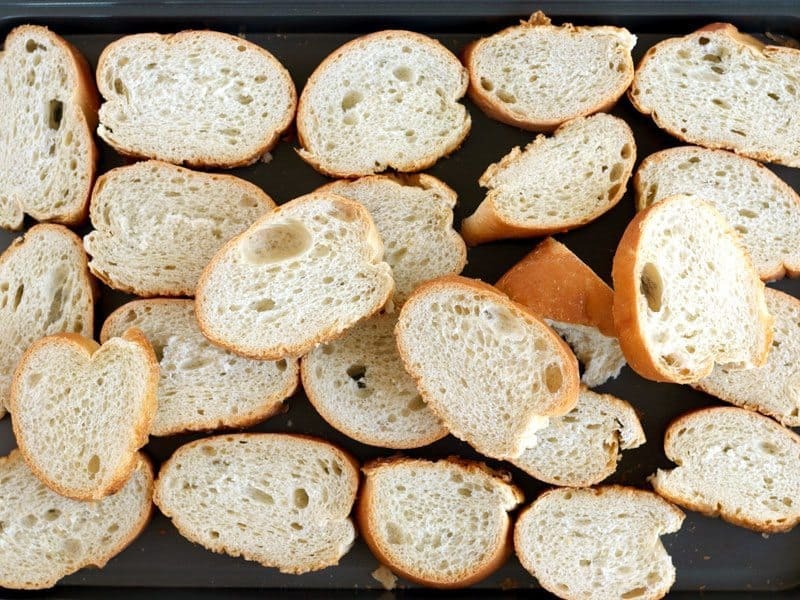 If it is not stale before beginning the recipe, you can slice the bread, place it on a baking sheet, and put it in the oven as the oven preheats. Want more Thanksgiving recipes? Check out our Holiday Recipe Archives! Seriously though, I need to make this year-round. This stuff is too good to save for Thanksgiving! 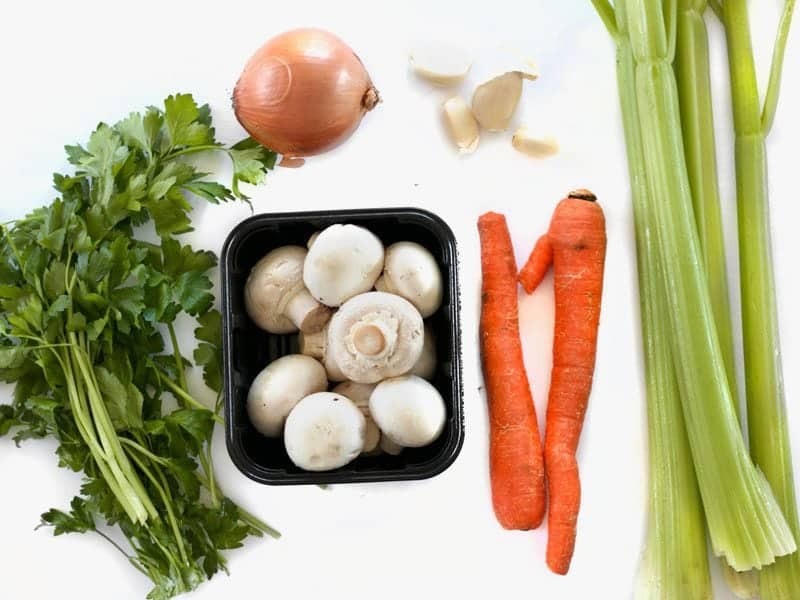 Start by prepping all of your vegetables (unless you’re a skilled multi-tasker, then you can prep them item by item as you add them to the pot to sauté). Dice one yellow onion, mince 4 cloves garlic, finely dice 4 stalks celery, shred 2 carrots using a large-holed cheese grater, slice 8oz. mushrooms, and roughly chop 1/4 bunch parsley. 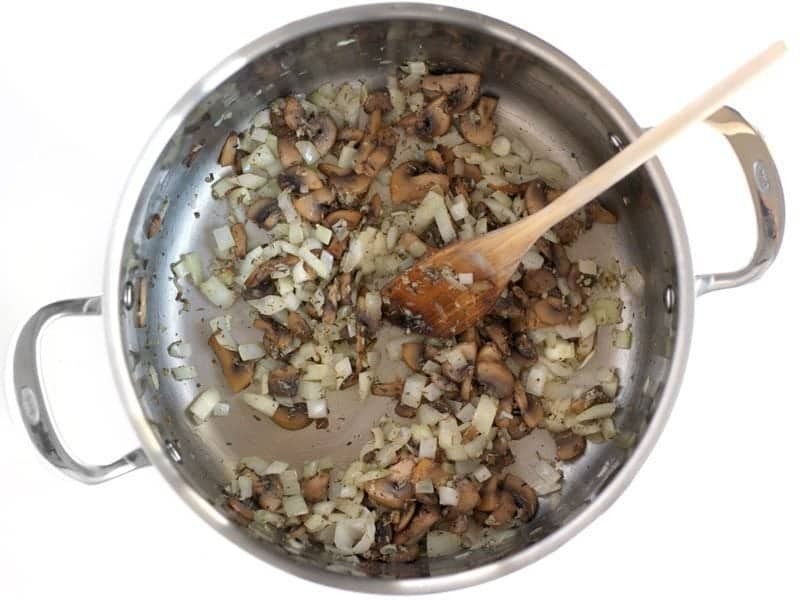 Add 3 Tbsp butter and the sliced mushrooms to a large pot. 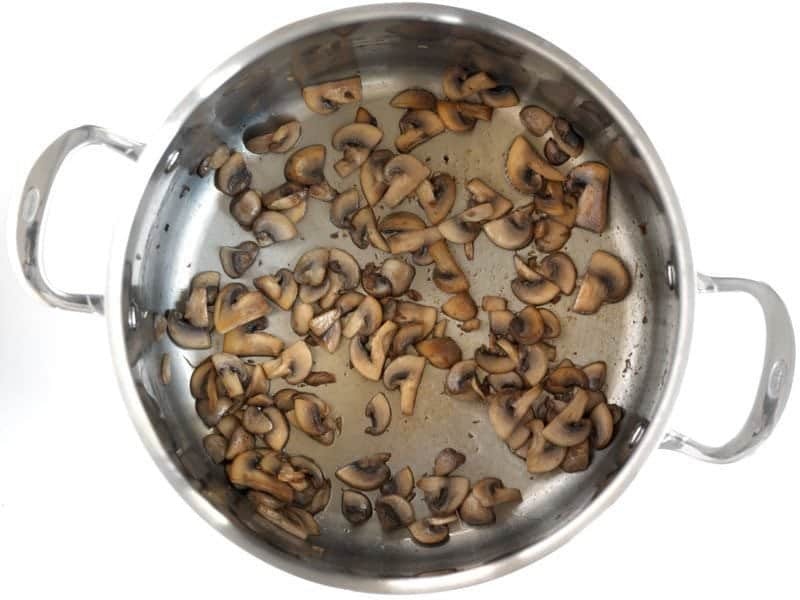 Sauté the mushrooms over medium heat until they have released all their moisture and the edges begin to brown and caramelize. Add the minced garlic, diced onion, 1 tsp dried sage, 1 tsp dried thyme, some freshly cracked pepper and about 1/4 tsp salt to the pot. Continue to sauté until the onions are mostly soft and transparent. Add the diced celery and sauté a few minutes more, then add the shredded carrots and sauté for just a couple minutes more. 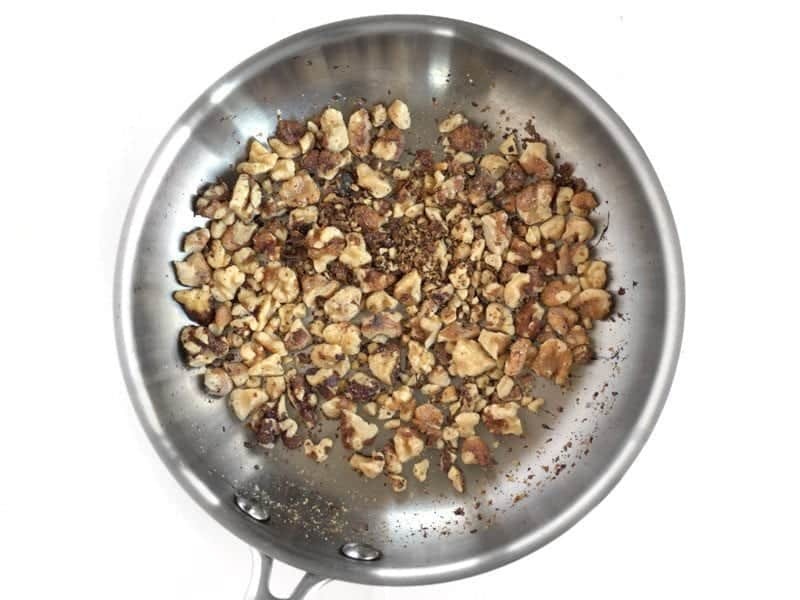 While the vegetables are sautéing, toast 1/2 cup walnut pieces in a dry skillet. Stir and cook them over medium heat for 2-3 minutes, or just until you start to smell a very nutty aroma. Remove them from the heat right away to prevent them from burning. Finally, stir the remaining 3 Tbsp butter, the toasted walnuts, and a handful of the chopped parsley into the pot with the vegetables until the butter has melted. Taste the vegetable mixture and add more salt if needed. It should be well seasoned. Turn the heat off under the pot and begin to preheat the oven to 350ºF. If your bread is not fully stale (as mine was not), you can slice the bread, place it on a baking sheet, and put it in the oven as the oven preheats. Let the bread cool before you cut it into cubes (more moisture evaporates as it cools). I used one large French loaf for this recipe, which yielded about 10 cups bread cubes. Cut the cubes into 1/2-inch cubes. Stir the bread cubes into the pot with the vegetables, butter, and herbs. Stir well so that the bread absorbs some of that yummy butter. Add 1.5 cups vegetable broth to the pot, 1/2 cup at a time, stirring well each time before adding more (I use Better Than Bouillon). The bread cubes may break down and crumble a bit as you stir, but that’s okay. The bread will not be fully saturated after all the broth is added. It will absorb even more moisture as it bakes. Coat the inside of a 3-quart casserole dish (about a 9×13-inch) with non-stick spray, then pour the stuffing mixture into the dish. Spread it out evenly, then pat it down slightly. Cover the dish with foil and bake for 30 minutes in the preheated oven. Remove the foil and bake for an additional 15 minutes, or until the top is golden brown and crispy. Garnish the Savory Vegetable Stuffing with any remaining chopped parsley just before serving. 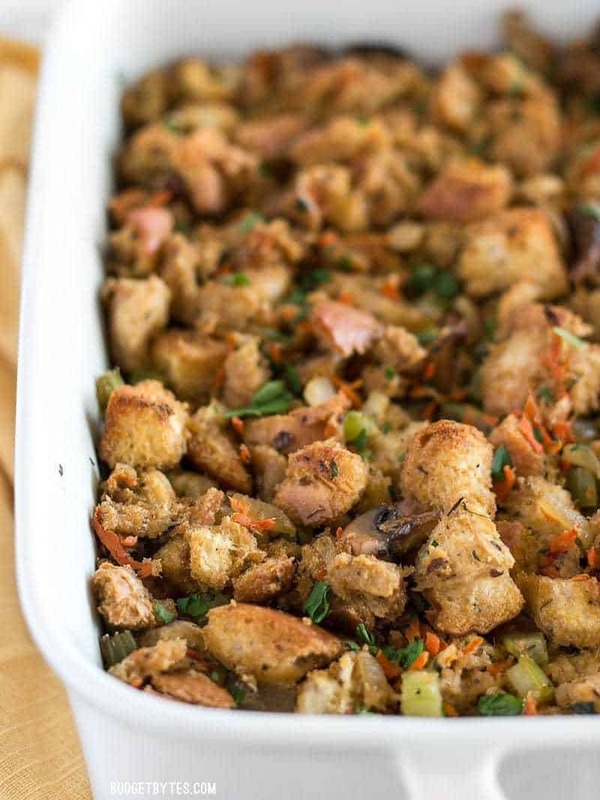 This recipe makes about 8 cups of stuffing. Hello, I love all your recipes I have made so far. About how many cups does the read equal out to when it is cubed? Unfortunately I don’t have a volume measurement for that, but the recipe is quite flexible so I would suggest finding a loaf that is about 18-24″ long. Maybe about 10 cups of cubed bread, if I had to estimate. Made this today and it was fabulous! Thank you! Love so many of your recipes! This stuff is amazing! I used vegan butter and Better Than Bouillon vegetable base for my vegetable broth. I also used dried parsley instead of fresh since I didn’t have any other use for parsley. 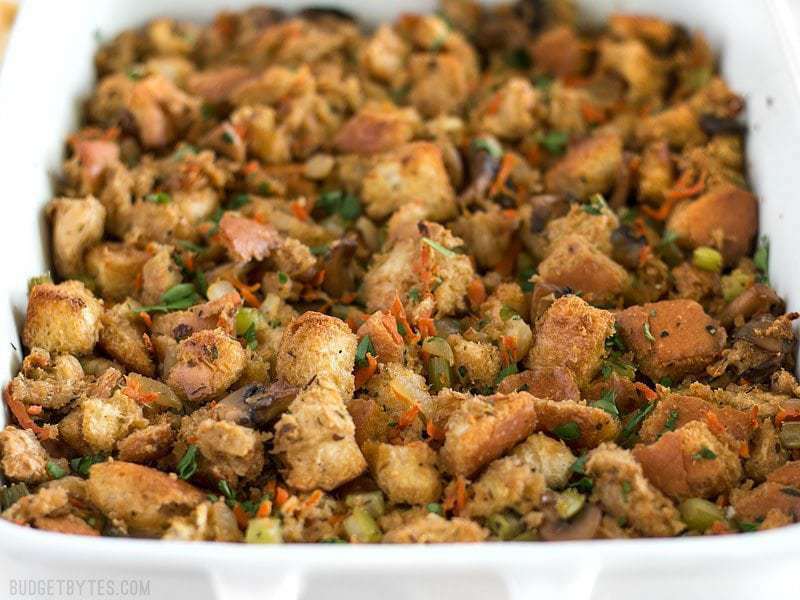 Stuffing is my favorite part of the Thanksgiving meal anyway but I’m obsessed with this particular dish. Thank you for this recipe! Hello, there! Happy Thanksgiving! This recipe sounds delicious and I would like to make it for this Thursday. I was wondering if I wanted to use fresh sage and thyme instead of dried, do you think one Tablespoon of each would be ok? Also, at what point do you recommend I add it? Thank you so much!! This is my first time making stuffing from scratch and your instructions are so helpful! Many Blessings. Hi There – am going to try this for Thanksgiving this year! Can I make this the night before and bake it the day of? Thanks! That should work well with this recipe. If I were to add cranberries, apples, and nutmeg, would you recommend forgoing the garlic? That’s probably a good idea so they don’t compete, but leave the onion in. Can I add dried cranberries and apples to this? If so, at what point do you recommend adding? Thanks! Hi, where it says “1/2 Cup chopped”, you forgot to put “Walnuts” :P I mean i figured it out but thought you may wanna know. Thanks! I’m making this right now to stuff inside your cranberry stuffed pork loin for Christmas dinner! I’d like to make this for a vegan Friendsgiving event, is the butter for flavor? I’d like to replace it with coconut oil or canola oil if possible. Thank you! The butter definitely does add a lot of flavor. Coconut oil would add that nice richness that butter has, but I’d be afraid that the flavor would be too strong. I’d see if you could get a butter flavored vegan spread.